To know who bombed Judi Bari and Darryl Cherney, it is much more important to determine why they bombed Judi Bari and Darryl Cherney. 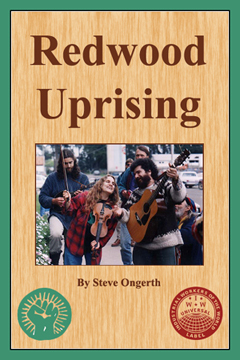 The two were targeted because they represented a viable democratic, populist, grassroots challenge to the powers that be, in this case, Corporate Timber, and its established paradigm of total control over the redwood forests of California’s North Coast and by extension—as you will see in this book—America’s forests in general, the modern timber industry, and capitalism itself. They stood upon the crest of a wave of change that was poised to undermine the existing order, and she was more than willing to ride it to its conclusion. That wave was a confluence of both environmentalist and labor movements and, if left unchecked in its course, it could very well have washed away institutions, both “private” and “public” that were, by many people’s accounts, corrupt and rotten to their very core. This book chronicles these struggles and how a divided community began to overlook their differences and fight against the real outside agitators: multinational corporations. The struggle is no less relevant today as multinational corporations continue to receive massive bailouts, working people struggle more and more just to make ends meet, and global warming threatens not only old growth forests, but civilization as we know it. The book will soon be available in hard copy, but in the meantime, the individual chapters are being released weekly on this site. To read them in order, visit this page. In spite of the bombing, Bari had lived, which was a huge miracle by itself, and it is clear that whomever planted the bomb in her vehicle had not intended for her to have done so. The bomber had also not planned on Cherney’s presence in the vehicle (his decision to ride with Bari had been unplanned and made at the last possible moment). The bomb had been meant to kill Bari and her alone, and leave behind a mystery, a discredited leader, and fractured and broken movement. Cherney’s having also been there and having gone through the trauma had created the unintended consequence of providing Bari with a witness who could independently verify and corroborate her every word (which, as it turned out, he did) thus further undermining any case that could be made for her guilt. Nevertheless, the bombing was nothing short of a huge tragedy for Judi Bari, due to the physical and emotional trauma and the intense pain and suffering she endured afterwards. While it may be something of a stretch to say that the bombing ultimately led to Bari’s death (in March 1997 due to breast cancer) even that is not out of the question, and the loss of her life was a major setback to those who would challenge business as usual. Bari’s and Cherney’s legal triumph was a victory, but not the final victory. The question of who bombed them still remains unsolved, but assuming that Bari and Cherney and their supporters (and to be certain the author is one) are correct, and the bombing was indeed a conspiracy involving both Corporate Timber and the FBI, the answer to the question, “Why?” bears little mystery at all. Clearly someone was trying to disrupt, discredit, and misdirect the coalescing radical, populist opposition to Corporate Timber on the North Coast, whether they participated in the bombing or not. Certainly, the bombing was itself designed to do that, so it makes sense to conclude that the bombing and the disruption were part of a single, multifaceted effort. If asked, “cui bono?” the most likely answer is a combination of Corporate Timber (namely representatives from all three of the major corporations, Georgia-Pacific, Louisiana-Pacific, and Pacific Lumber) with the help of the FBI with the tacit (or perhaps approval) of the Bush (senior) Administration. The FBI had gone to great lengths to try and discredit Earth First! already in Arizona, and clearly the same telltale signs of a COINTELPRO operation are evident in the Bari and Cherney bombing. If G-P was involved somehow, there is no direct evidence, but evidence of L-P’s involvement is quite readily apparent. As for Pacific-Lumber, Bari and Cherney later discovered a cordial “chummy” letter to FBI Director William Sessions from a Maxxam board member. There is ample indirect evidence and a clear motive linking all three to the bombing. —Judi Bari’s recollection of the bombing, February 2, 1990. —Darryl Cherney’s account of the bombing, May 24, 1990. At this point, Cherney looked over at Bari where, “she was slumped in her seat, screaming in pain, but as far as I could tell, her body was in one peace.” Bari recalls only being able to make guttural sounds in an attempt to say “help” and vaguely recalls that Cherney kept repeating “I love you,” to her, and that she was going to live, in spite of what had happened. The blast distorted Bari’s white 1981 Sabaru GL car’s unibody frame, tore out its left side and sent debris and heavy blue-grey smoke flying into the air. It blew out some of the windows and left a trail of fragments on Park Boulevard. The shattered, smoking car veered 100 feet down the road, clipping parked cars and light poles along the way, and hit another vehicle—a delivery truck driven by 40-year-old Ken Rich from Castro Valley—before coming to a stop against a curb in front of Oakland High School, where students were jogging as part of their physical education class. Had the explosion occurred just forty minutes later, it might have injured the students crossing the road to patronize the local shops for lunch. The nearby public school’s officials would keep the students inside campus buildings for several hours until the blast area was declared safe. Rich’s vehicle then hit a woman pedestrian who had a heart attack. He had happened to have been driving the other way, and noticed the smoke billowing from Bari’s vehicle just before it hit his own. The explosion startled the workers and owners at nearby businesses. “It sounded like they dropped a bomb from a jet or something,” recalled the manager of a nearby Oil Changers, “the whole street just shook.” One of the garage mechanics, who identified himself as “Charles”, added, “It sounded like a cherry bomb in a tin can. It was pretty loud. I kind of felt it in my body, and I was inside.” Sokhi Dosanjli, the clerk at a local convenience store reported that the smoke was so thick that, “You couldn’t see anything for awhile”, including the nearby MacArthur Freeway. Darryl Cherney returned from Arizona, refreshed and ready to resume organizing, but the situation in Humboldt and Mendocino County was as volatile as ever. The buildup to Redwood Summer was exceeding all the organizers’ expectations. It was clear to everyone that the North Coast was about to experience a civil war. Accusations of “polarization” and “violent rhetoric” were constantly leveled at the Earth First! and IWW activists preparing to organize Redwood Summer, and many of these came from both local and corporate media outlets. The picture they painted was one of a once peaceful and prosperous region of logging communities disrupted by environmental extremists bent on wreaking havoc on the struggling, hard working timber workers of the region. Such descriptions couldn’t have been more divorced from reality. Supervisor Henry no doubt naïvely assumed that she could negotiate some sort of agreement whereby the demonstrations would not result “in serious injury or economic disruption”, but this failed to understand the true nature of the problem. As was the case in the original Mississippi Summer, appealing to the rule of law was impossible when the law was bought and paid for by the perpetrators of the injustice being challenged in the first place. It was at best foolhardy to ignore the fact that economic disruption had already been occurring (at the hands of the corporations) now for over a decade. Bari faced a Catch 22. She knew that little was to be gained by appearing at what was likely to be a star chamber of hostility, but to not appear would allow the charges against Redwood Summer to go unanswered, and Bari was determined not to back down in the face of prejudice this time. Knowing that she would be hopelessly outnumbered, she enlisted as many allies as she could muster.